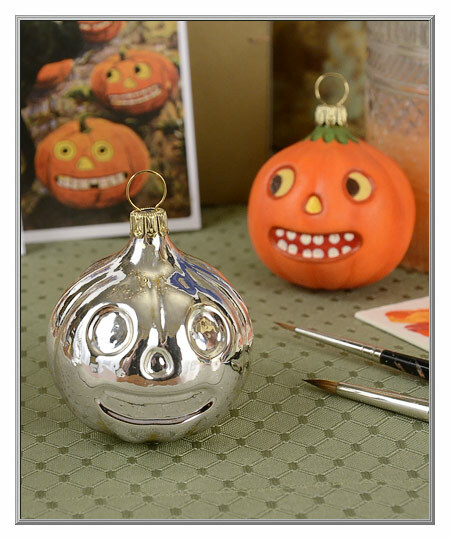 This nostalgic Jack-O'-Lantern pumpkin is a striking silvery ornament on a tree, or you can paint it to create your own custom decoration! Our original design that we sculpted and brought with us on a visit to the Werkstatt of a glassblower friend in Lauscha, Germany, this old-style ornament is ours alone. Tips from our artists: when using acrylic paint, we recommend you first coat the ornament with a spray of satin or matte finish lacquer so the paint will adhere to the glass surface. 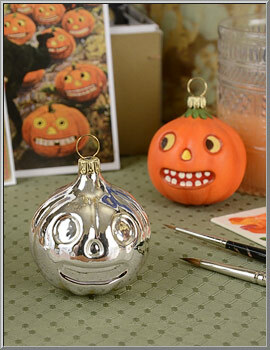 After it is painted, coat the pumpkin with a liquid or spray satin finish to give it a polished look. Sold as one glass ornament. the cap (not including the loop). to be available later this Summer.